Luxury travelers love airlines that deliver a true luxury experience, and make flying on them a party in the air. The airlines that manage to do this are few and far between, and they become legends. One of these fabled carriers is Emirates Airline. Emirates is based in Dubai, the United Arab Emirates city with a fantasy skyline of impossible-seeming skyscrapers that has become the Middle East's luxury playground. Founded in 1985 with only two aircraft, Emirates now flies the world's biggest fleets of Airbus A380s and Boeing 777s. Emirates currently has 96 A380 jets in service and has 48 on order. (The airline first started operating A380s in 2008.) These jets are massive with a passenger carrying capacity of up to 615 people on long-range flights. In total, Emirates has more than 23,000 cabin crew members and more than 1,500 pilots dedicated to this type of aircraft. 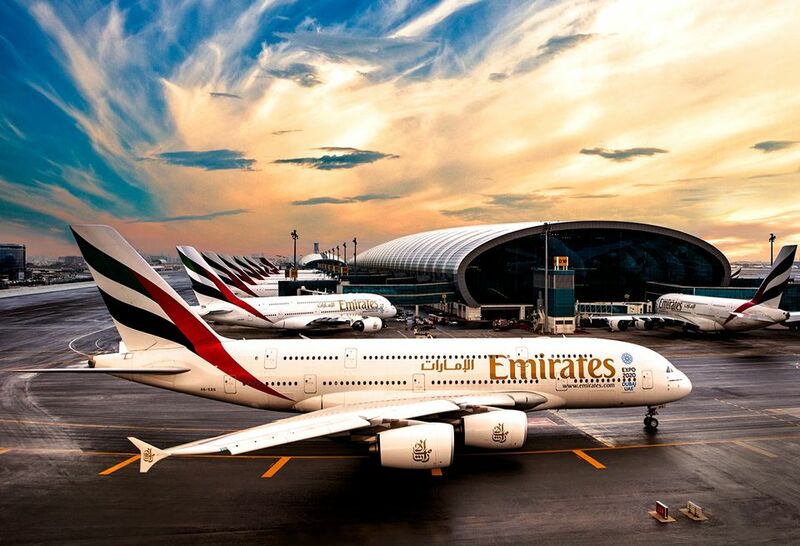 The A380's longest Emirates fight is 14,193 kilometers, flying from Dubai to Auckland, New Zealand. Its shortest is just 851 kilometers from Dubai to Kuwait. It's also an environmentally responsible way to fly, with a low CO2 output. Emirates flies nonstop to 160 global destinations, including 12 American gateways (NYC, Boston, Washington, D.C., Chicago, Houston, L.A., San Francisco, Seattle, Dallas, Orlando, Fort Lauderdale and Newark). Emirates' A380 jets are two-level. Economy seating takes up the lower floor, with Business Class and First Class upstairs. The A380's Business Class seats are ingeniously engineered private little pods. They offer everything you need for inflight comfort. The jet's seating pods make it easy to do everything you want to do on your long flight. It's easy to fall asleep in Business Class and arrive refreshed in Dubai or back home. Seats recline into fully flat beds, and a flight attendant will bring you a cushy mattress, pillow, and blanket. You'll also find noise-canceling headphones and a high-quality sleep mask already at your seat when you board. You can entertain yourself in a multitude of ways right in your seat. The inflight ICE system—information, communication, entertainment—streams everything from flight cameras to Dubai info to over 3,500 channels of movies, TV, music, and games in multiple languages on a 23-inch screen. There's also an HDMI port if you want to display content from your own devices on the screen. You can get work done at your seat, which feels like your own private mobile office. Amenities include a desktop, lights, chargers, and WiFi. Meal service includes dinner, snack, and breakfast, and it's beautifully served on white linen and china. There are also options for vegetarians and Halal eaters. And you can savor top-shelf wine and liquor, as much as you want, when you want. As soon as you board, you're offered a selection of fine wines and a French Champagne. You can try them all throughout your flight, or stay loyal to one. Flight attendants will keep your glass refilled if that's what you want. If you want to step away from your seat, there's also an onboard lounge with a bartender. You have a snack (mini sandwiches and quiches, smoked salmon, shrimp cocktail, and more) or grab a drink while you chat with other passengers and watch live entertainment on the 55-inch screen. Business-class tickets on Emirates come with many perks. Here's a great one: a private driver picks you up and takes you to the airport. Another one: Business class passengers are permitted two bags of up to 32kg (71 pounds) each. The lounge is an oasis of grace that resembles a luxury hotel lobby but with food and beverage on the house. Lounges offer ample, cushy seating, work counters with complimentary wifi and charging stations, ample TVs, and dozens of newspapers and magazines. Need some shuteye? Give wakeup instructions to an attendant and grab a reclining lounger. Head to the Moet and Chandon champagne lounge for champagnes paired with small bites. In the lounge, you'll also find a selection plus good wines from France, Italy, California and other regions, plus hard liquor, beer, soft drinks, coffee, cappuccino, and tea. The Health hub also offers lighter options, such as fruits, smoothies, and juices, as well as smoked salmon with broccoli, grilled vegetable wraps, and more. Overall, Emirates' Business Class lounges are so pampering, you'll wait till the last moment to board. The passenger service provided by the personnel is the airborne equal of authentically five-star hotel service. The crew constantly radiates personal warmth and likes to get to know you and your tastes. The job of an Emirates Flight Attendant is a prestigious position coveted by well-educated young adults the world over. Many are top-achieving college grads who welcome the opportunity to be based in Dubai, to see the world, and to mingle with Emirates passengers. All crew, no matter where they're from, speak fluent English (an official language of Dubai), but the crew is truly international. As is common in the travel industry, the writer was provided with complimentary flights for the purpose of describing the airline. For details, see our site's Ethics Policy.